The ultimate Hi-Fi rack or TV stand arrives in the powerful form of HIGH-END. 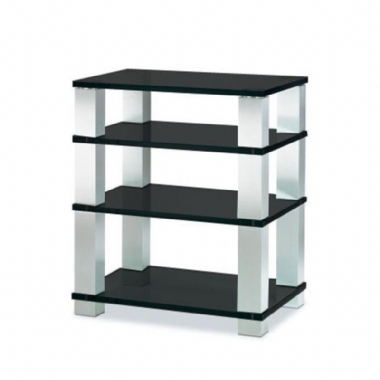 Big 60mm x 60mm aluminium pillars with extra-thick 12mm oscillation glass shelves are the features which makes HIGH-END really at home when being a home for especially high-grade hi-fi and home cinema equipment. HIGH-END can be further customised with either spikes or double castors at the base and an optional cable channel to keep wires and connections under control. One of the most common restrictive aspects of enjoying high-end audio are stands or racks with a lack of generous space. HIGH-END shelves, with a width of 48cm and a depth of 55cm provide enough space to accommodate large power amplifiers and other quality components. HIGH-END delivers some of the thickest glass shelves ever seen in hi-fi furniture. Constructed from a series of glass plates, bonded together to create a thick slab of non-oscillating glass. Vibrations are dampened and eliminated and music sounds crisp, clear and detailed as an end-result. The edges are incredibly precisely cut, chamfered and smoothed by hand and comes in three luxurious options; Clear, Black or Matte.